Kerry is a refugee of the software industry. He spent more than a decade of his life flipping bits, first as one of the principal developers of the database product FoxPro for the now mythical Fox Software, and then as one of Bill Gates's minions at Microsoft. He is a husband, a father, a technophile and a movie buff. 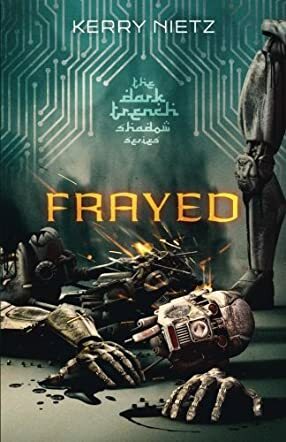 Frayed: DarkTrench Shadow Volume 1 by Kerry Nietz is the story of a debugger, a human who has been altered and given a set of rules that he has to live his life by. ThreadBare is a human, but it seems like centuries since he actually felt like one. He lives in a garage where he works to “fix” machines and debug them. All he wants to do is become better than BullHammer and be recognized for his efforts. When he is relocated from his garage to serve the Prince at the Palace, he believes that his life is about to change, but he has no idea how good or bad the change will be. The Prince asks ThreadBare to do things that he feels are wrong, but he is programmed to follow orders, so he does exactly that, even if he knows the difference between right and wrong. He is not supposed to feel that. He should not question, especially the Prince. But something has awoken in him that he cannot repress or suppress. These are forbidden feelings and he has no business feeling them. But how can he do that? Especially when this has awakened things in him that he cannot control! Frayed is a deep, intense and dark novel that will have you sitting on the edge of your seat and biting your nails. I really liked ThreadBare, he is a complete character and his development was intense yet very believable. I liked him, I liked his reactions, and I loved how he took charge of the situation, especially when he made up his mind. The themes of spirituality and religion are strong, but they do not take the attention away from ThreadBare’s journey. This is simply too good to explain! It is brilliant.